Germany Elections: Right-Wing AfD Party Enters Parliament For First Time : Parallels "We will hunt Chancellor Merkel. 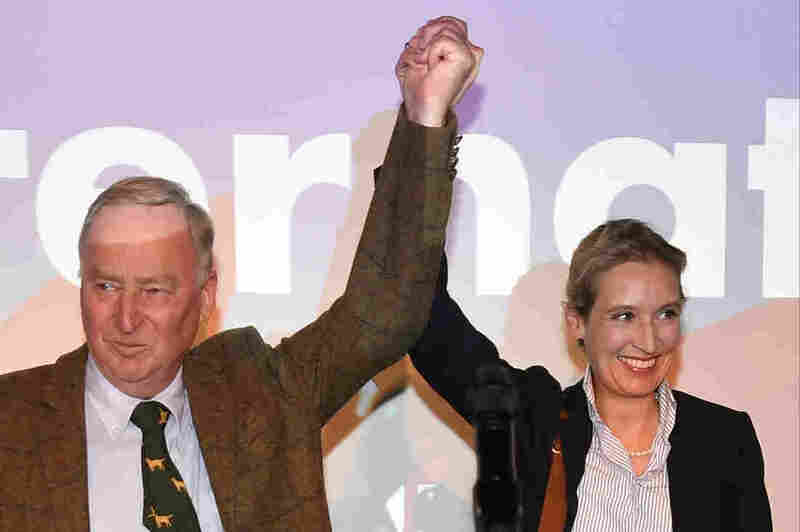 We will bring our county and our nation back," AfD leader Alexander Gauland told a cheering crowd of supporters. Is this a foretaste of the new tone in the parliament? AfD top candidates Alexander Gauland, left, and Alice Weidel celebrate with their supporters during the election party of the nationalist Alternative for Germany, in Berlin, Sunday, after the polling stations for the parliament elections closed. Although exit polls from Sunday's German elections say Angela Merkel will remain chancellor for a fourth term, the result Germany is talking about is that of nationalist right-wing party Alternative for Germany, or AfD. The AfD has not only entered the German parliament for the first time, but it's also succeeded in being strongest of the smaller German parties, making them the third-biggest party in the incoming legislature. Having failed to enter the Bundestag in the last election, the party is now likely to have nearly 100 seats in parliament. Despite coming in first, Merkel´s Christian Democratic Union lost significant support, achieving their worst result since 1949. Her challenger, Martin Schulz, from the Social Democrats, led his party to its worst result since the founding of the German Federal Republic. Schultz said he would not go into another grand coalition with Merkel, preferring to rebuild his party as the leader of the opposition instead. Merkel is now expected to try to build a new coalition with the Liberals and the Green party. The success of the AfD is even bigger than most polls had predicted. It's the first time since the Second World War that a party professing such xenophobic, anti-immigrant and anti-Islamic views has been voted into the Bundestag. Their campaign centered on being the voice of Germans who are angry about the number of asylum-seekers allowed into the country in the past two years. They also attacked what they called "political correctness," saying they will not accept anyone ordering them to be quiet, proclaiming the end of the era of political correctness. Some members have espoused the values of the extreme right, and one of its co-leaders, Alexander Gauland said publically that Germany should be proud of its past and the achievements of its soldiers in two world wars. Another reason for the AfD's success is their strong online election campaign, helped by a Texas political strategy firm that critics accuse of introducing negative campaign tactics to an extent not previously seen in Germany. Moreover, the AfD has been successful in casting themselves as victims of the political establishment and the mainstream media. One of their main candidates, Alice Weidel, stormed out of a public TV debate during the campaign, claiming she was being treated unfairly. The AfD also succeeded in making itself a consistent headline during the campaign, using targeted acts of provocation to ensure TV news coverage. Constanze Stelzenmueller, a political scientist currently at the Brookings Institution, gave NPR an early analysis. "The AfD's success has many parents," she says. "A too-placid campaign by the governing coalition and its chancellor, Angela Merkel; the grand coalition's inability to address the concerns of German citizens about integrating refugees; and a ferocious AfD campaign on social media and in the streets." According to public broadcaster ARD, 60 percent of AfD voters say their vote has been triggered by disappointment with the established parties, while 31 percent cast their ballot for the AfD based on political conviction. Between 90 and 99 percent of AfD voters say the party understands the issues they care about better than the other parties. They say Germans do not feel safe anymore, they want to decrease the influence of Islam in Germany and limit the influx of refugees. Asked for their main concerns, AfD voters said they were afraid of Germany losing its culture, and that the influence of Islam would force great changes in German life. They also feared an increase in crime rates, and demanded that the country do more to secure its national borders. The migration crisis might have been less of a topic in recent months, but it has changed the political atmosphere in Germany. During the campaign, Chancellor Merkel often faced right-wing protestors at her public appearances. One-hundred percent of AfD voters disapprove of Merkel's actions during the migration crisis, and are not convinced that her political decisions will improve things in the future. Looking at the composition of the AfD electorate, it's apparent that the party was very successful in mobilizing former non-voters. Almost 1.2 million AfD voters were previously non-voters, while the second-biggest group of AfD voters, more than 1 million strong, previously supported Merkel's party, the CDU. Even the Social Democrats lost about half a million voters to the AfD. Speaking from Berlin on Sunday evening, Jackson Janes, president of the American Institute for Contemporary German Studies, told NPR that the AfD's feat was a result of "a mixture of fear, fatigue and frustration: a mobilized fear of immigrants, fatigue after 12 years of Merkel in office, and frustration with political party leaders who don't seem to be listening to voters' concerns." Although all of the other parties in the German parliament have said they will not cooperate with the AfD, its arrival in the Bundestag amounts to a political earthquake in German politics. As one sign that the atmosphere in Germany's calm, consensus-seeking parliament is about to change, AfD leader Alice Weidel says her party will demand a committee of inquiry against Angela Merkel, to investigate possible breaches of law by the chancellor during the migration crisis. A previous version of this story misidentified the right-wing party as the Alliance for Germany. The name of the group is Alternative for Germany.